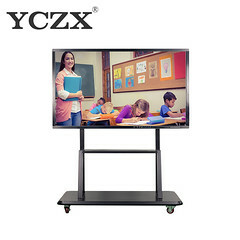 The interactive whiteboards for business and interactive screens for schools are becoming more and more popular. The interactive touch screen display with smart touch,10 points IR touch technology, HD web camera video. The innovative interactive touch screen display technology provides a smooth pen-on-paper writing performance enabling teachers and students to collaborate with ease. The innovative interactive touch panel technology can detect finger, pen, interactive touch display and palm erase allowing students’ simultaneous collaboration. Easy connection to interactive touch panel makes presentation and cooperation easier. Easily mirror mobile devices to share content or connect pc, computer to support your meetings or lessons. Join the meeting wherever you are. With the help of internet and video conference software, it is much easier to have a real-time far distance conference. No matter you are at home or have a business trip, interactive whiteboards for business is possible to communicate and have a meeting through devices whenever and wherever. Do you think this blog is help for you? If you want to learn about more, follow us and we will update more knowledge for you.